A land of marvels awaits in the Mediterranean. History dating back centuries emerges through architecture and monuments, while modern culture thrives. Whether it’s exploring Ancient Greek ruins or spotting celebrities at Monte Carlo, the Mediterranean regions covers an expansive cultural spectrum – and it’s all waiting for your visit through Seabourn. Intimate, luxurious experiences characterize Seabourn’s five ships traveling the region. Major cities, of course, are on the itinerary, but with so much emphasis placed on culture, the smaller towns let you into another side. Art, world-renowned cuisines, several grand empires, and modern innovations exist around the Mediterranean’s perimeter, so prepare to explore all of it in detail with Seabourn. 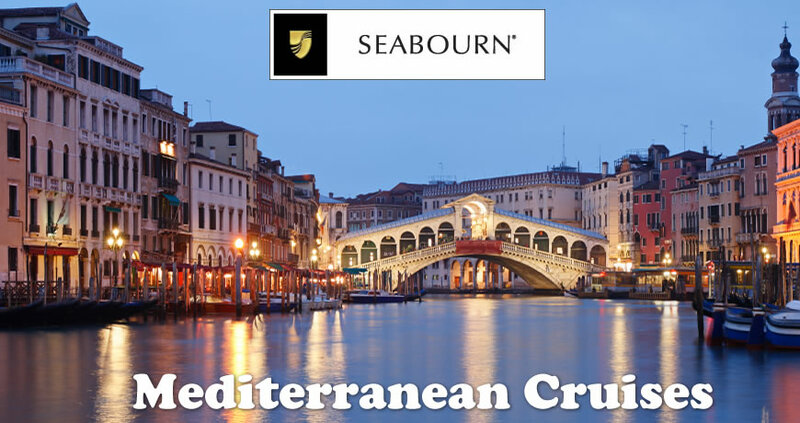 Seabourn’s Mediterranean cruises last a minimum of 11 nights at sea. Itineraries include the standard options – Eastern, Western, the Holy Land, and the Black Sea – and also traverse the entire region. What makes Seabourn stand out is the attention to detail: Rather than simply go from one major city to another, smaller villages and ports make up a significant part of the itineraries, particularly when they focus on a specific country to region. Eastern Cruises: Venice to Turkey appears as a short distance geographically, but historically, you encompass three major empires. As you explore ruins and modern remnants from the Roman, Greek, and Ottoman Empires, the balmy sun makes perfect weather for enjoying the outdoors – preferably on one of the region’s well-known beaches. Or if your goal is to try as many cuisines as possible, this itinerary places you in the perfect spot. Depending on length, Seabourn takes travelers to Venice, Dubrovnik, Corfu, Igoumenitsa, Sami, Vathi, Katakalon, Gallipoli, Kusadasi, Marmaris, Istanbul, and the Black Sea region – with many more smaller ports in between. Western Cruises: Phoenician to modernist architecture. Ibiza to Monte Carlo. And a tour through some of the world’s fashion and culinary capitals. Where else could you be but the Western Mediterranean? Itineraries focus in detail on Portugal, France, Spain, and Italy, or encompass the entire region from Lisbon to Italy’s western coast. Depending on trip length, you may see Monte Carlo, Barcelona, Ibiza, Marseilles, Bordeaux, and Malaga, among several other smaller ports in between. The Black Sea: Alone or as part of an Eastern itinerary, the Black Sea region connects to the Mediterranean but presents an entirely different character – one of Eastern European resort towns contrasting with history dating back to the time of Noah’s Ark. Ports frequently include Constanta, Varne, Nessebur, and Sinop. Holy Land Cruises: The familiar, popular sights of Venice and Greece transition to the historical and religious relics of Ancient Egypt and Israel. After visiting Jerusalem and other Israeli ports, Seabourn passes through the Suez Canal and travels down the Red Sea to go along the Arabian Peninsula’s coast. 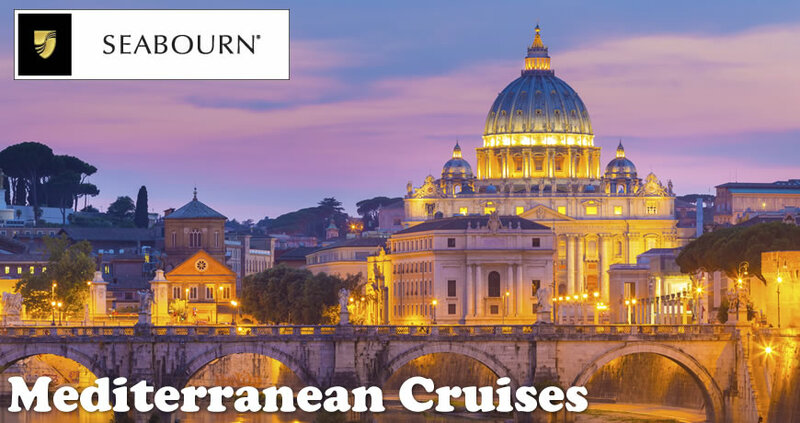 The Mediterranean’s expansiveness entices travelers from across the globe, with Seabourn’s well-known luxury being an asset adding comfort and glamour to your trip. Visit this significant region after booking your trip through Direct Line Cruises today.